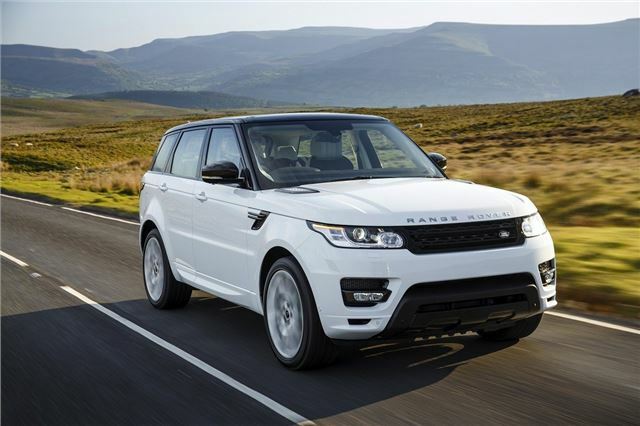 Since its introduction in 2005, the Range Rover Sport has been a sizeable sales success for Land Rover. Until the arrival of the entry-level Baby Rangie, the Evoque in 2011, the Sport was LR's volume seller, proving far more popular with city dwellers than their gentrified cousins. Either you considered the old Sport to be a dilution of the Range Rover marque, or you thought of it as a more accessable entry point into one of life's more sybaritic driving experiences. Either way, it's now an established part of the Land Rover family, which has just undergone a seriously radical overhaul into its second generation. The all-new Sport starts from a better vantage point than the old, Discovery-based, model. The all-new Sport, then, starts from a better vantage point than the old, Discovery-based model. It's not that it wasn't capable on- or off-road, but sitting as it was on LR's twin-rail T5-platform, it was a heavy old thing. Starting out with the new Range Rover's lightweight monococque blesses the new Sport with more than 400kg of weight savings, model on model. That's important, because although the increases in efficiency will be welcomed by owners, what it also means is that the lighter-footed Sport will also stand a fighting chance of out-pointing - on-road - rivals such as the BMW X5, Audi Q7 and Porsche Cayenne. Visually, the Sport is a good effort, which combines the daring rising shoulder-line/plunging-roof of the Evoque with the top-of-the-line Range Rover's stately stance, to tread a middle-line between the two. You could argue that it lacks true adventurism, but its two sister models have set out their stall already, leaving the classy, less blingy, Sport to slot in logically somewhere in the middle. 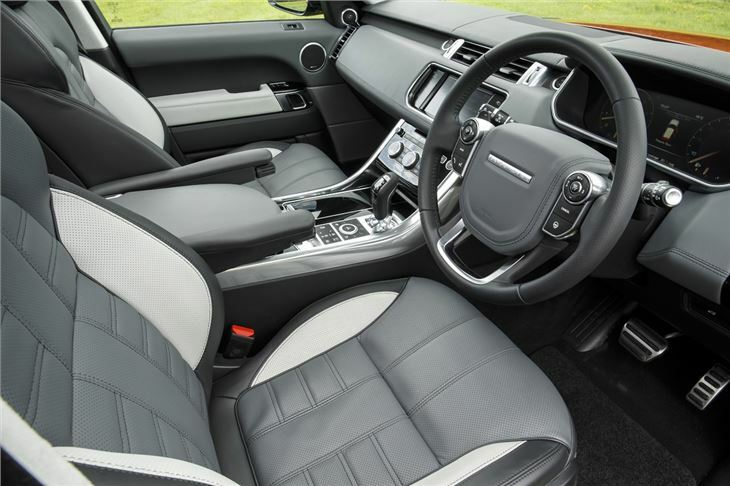 That 'in-betweener' approach to design has also taken place inside, with its sophisticated interior architecture being shared with the Evoque and Range Rover - both heavily inspired by the 2001 original. 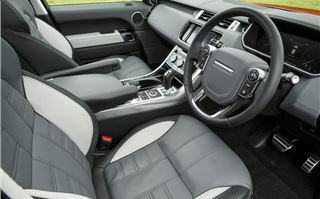 But the Sport's car-like driving position is stuck somewhere between the Evoque's more radically reclined front seat, and the lofty imperiousness of the top Range Rover. And it works because it's still commanding enough to have you going eyeball-to-eyeball with Transit drivers, a positive selling point with these cars. The interior is a triumph of design. It manages to make the driver feel special thanks to its use of hgh quality materials and great colour and trim judgement. It's stacked with equipment, and much of the control set is grouped in the high centre console, based around two areas - the large centre touch screen for the gadgets, and the centre rotary knob for the transmission. It works well, and is logically laid out, once you've mastered it all. Only the engine Start button mounted high on the dash and the electric window switches on the door-tops seem out of position. And - joy - it has a traditional gear lever! As for the all-electronic instrument pack, you'll either love it or hate it - but there's no denying it's useful for displaying the Sport's vitals in differing drive modes. The boot space is 784 litres (down from 958 litres of the old model), but the upsides are much more leg- and hat-room in the rear; and the £1500 option of a pair of electrically-operated rear seats mounted in the boot, to bring the total up to seven. That really is a big leap forward. The engine range at launch is limited to the 3.0-litre SDV6 diesel, expected to make up the majority of sales in the UK, and the rousing 5.0-litre Supercharged petrol, which will no doubt attract all of the press attention. The TDV8 and diesel hybrid models follow on later, as does the lower-powered 258PS TDV6. All models are combined with the excellent eight-speed ZF automatic transmission, which is optionally controllable by paddles depending on the model. Variable torque-split four-wheel drive and a TorSen centre differential are standard across the range. The numbers tell you all you need to know about just how more efficient the new Sport is, and just where the main benefits of that weight-saving platform lie. The SDV6's emissions are down to 199g/km from 230, while its combined fuel consumption improves to 37.7mpg from 32.1. Performance is similarly improved, with 0-60mph acceleration now at 6.8 seconds, with a maximum speed of 138mph, very respectable indeed. Those improved numbers add to a genuinely more responsive and sprightly feeling on the road. The use of the Range Rover's underpinnings makes a massive difference, too. With its short and long arm front suspension with height-adjustable air springs with a similarly sprung multi-link rear, it's a complex set-up. The lower-specification models, make do with passive damping and anti-roll bars, but higher up the range, there's electronic active control. You can also specify the optional two-speed transfer box for ultra-low crawler gears, electronic terrain response, along with the fully adaptive suspension and a torque vectoring system. Very little will stop a fully-optioned Sport in its tracks. We managed to bag serious time behind the wheel of both the SDV6 and Supercharged models, and were treated to a great mixture of Welsh B-roads, English motorways, mountain gravel tracks, and a couple of off-road routes. Most importantly, we managed to get the Sport embroiled in a couple of urban school runs, so managed to take in just about everything owners will throw at their cars. What becomes evident very quickly is that with its excellent ride quality and comfortable seats, it's a car that's painless to spend time in. In the city, the driving position works very much in your favour, affording a great view over the roofs of cars around you - and appreciably higher up than the rival Germans. Visibility is very good, with refreshingly slim and unobtrusive A-pillars, and plenty of glass all-round. Parking cameras and large door mirrors, combined with the boxy shape, make the bulky Sport easy to park. Steering is light at low speeds, too, but there's absolutely no vagueness, so threading it through tight gaps is nice and simple. You'll enjoy precise, well-weighted steering, tidy handling, and a feeling that it will go where you point it. Very quickly indeed. The Supercharged model was the easiest to love thanks to its 515PS shove and epic soundtrack, but it's hard justify in the UK, thanks to its prodigious appetite for petrol. But for those who can run the petrol they'll be treated to a genuinely quick and capable SUV that on challenging roads, really does feel considerably less than its 2100kg bulk. It accelerates viciously, hitting 60mph from zero in 5.5 seconds, and will run to 100mph, and back to zero again in 17. High speed stability is brilliant, and the braking is beyond reproach - and for those who need to hare along B-roads, you'll enjoy precise, well-weighted steering, tidy handling, and a feeling that it will go where you point it. Very quickly indeed. Dynamically, the Sport is first rate. The suspension is stiffer than before, and it turns-in to corners with very little roll, and exemplary body control. It's all about fluidity of response, be it the steering, suspension or brakes, and feels like a superbly engineered and communicative car to drive. Is it as sporting as the Cayenne, X5 or Q7? No, but it's more than equally capable. It's much the same story with the diesel model, just with less drama. But it's far from let down on the road, and still manages to build speed and momentum, both effortlessly and rapidly. Fuel consumption is the main reason for going diesel - and although we didn't brim it, the computer reported 25mpg on our mixed route. Compare that with the early teens we got from the Supercharged car when driven in a similarly spirited manner, and you'll not need much persuasion to go down the diesel route. As accomplished as the Sport is on the road, it should never be forgotten that it's a Land Rover at heart - and the company won't let you forget this. What that means is that it's incomparable off-road. We had two opportunities to run the Sport off-road, the first at the company's well-known muddy base, Eastnor Castle, and at a forest in the Cotswolds. In both venues, the mud-plugging capability of this car shone right through. You can leave it in Auto mode, and as the going gets more arduous, the more the Sport's electronic systems intervene and compensate. The All Terrain Response system allocates torque to the wheel with the most traction, allowing car to continue moving, even if three wheels are spinning. Then there's the air suspension with its huge amount of travel, which under central control, will drop into the deepest ruts in order to maintain contact with the ground. The Sport drives supremely well on road, with a delicacy and balance that's as welcome as it is surprising. But to be able to combine this with the car's undoubted off-road ability is a truly staggering achievement. Then there's the ability to climb the steepest, most slippery gradients. Basically as a driver, you plant the throttle going up, and the electronics pull you up; while going down the other side, take your feet off, and let the latest version of Hill Descent Control to take you down without having to do anything but steer. Using the drive mode controls in the centre console allows the driver to fine tune the transmission's and suspension's electronic settings, but for most of the time, Auto will be all you'll need to get through, even in the most demanding conditions. Finally, mention should be made of the Sport's 850mm wading depth, and the camera-based monitoring system that you can use in the centre-screen - all very impressive stuff. And it's this that really sets the Sport apart from its most immediate rivals. Yes, it drives supremely well on road, with a delicacy and balance that's as welcome as it is surprising. But to be able to combine this with the car's undoubted off-road ability is a truly staggering achievement. Add this to its superbly appointed, beautifully designed interior, and you end up with a great product from a company that's on a high at the moment. Criticisms? You could say it's not quite sporting enough, although that leaves the door open for a supercharged R version in the future, and it's far from cheap when optioned up. But otherwise, it's a brilliant effort.